Getting there: From Highway 183 in northwest Austin turn south onto Spicewood Springs Road. Continue south for several blocks and look for Canyon Vista Middle School on the right. Park in front of the school and walk to the opposite side of the main building. A large green transformer sits next to the trailhead. The Hike: I began the hike at the waypoint "Trailhead", which lies at the back of Canyon Vista Middle School. 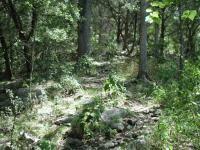 The trail at the start of hike is fairly well maintained, though it's a bit rocky as it descends to the creek bank. From here the trail technically forms a T junction where one can go left or right. However, the larger trail goes to the left. 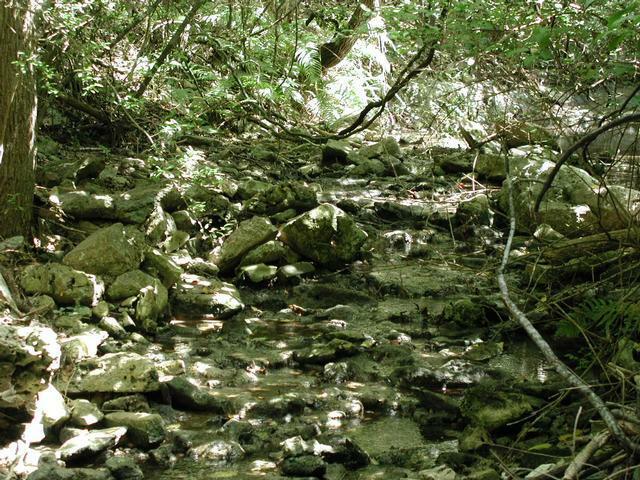 The initial few hundred feet of the trail descends down a rocky slope to the creek bed. 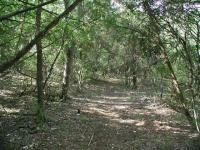 For a short distance the trail is pleasant and relatively flat. The trouble soon begins as brush and vines close in. At a couple of points I almost had to push my way though vegetation to keep going. Some of the debris may have been deposited by a flood in the not too distant past, though none had occurred recently. 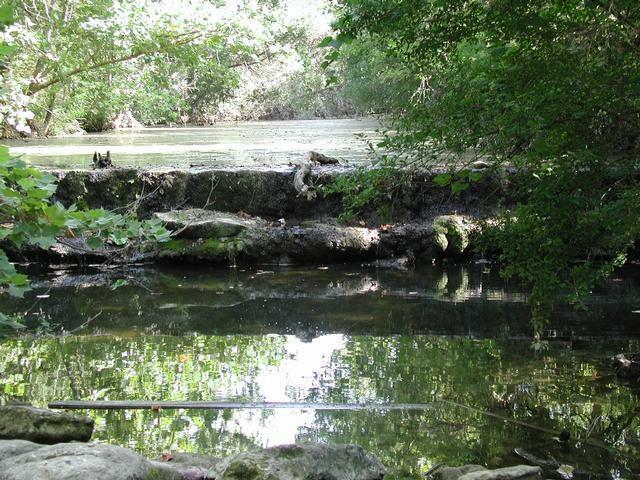 The Upper Bull Creek Greenbelt lies a short distance from both St. Edwards and Talleyran Parks. Yet this one seems to have been forgotten and relegated to second class status, despite its promise. The nature of floods in this creek valley may have played some role in getting to its current state. Strong city or community support appears to be lacking and the park suffers as a result. Near the trailhead the paths are fairly mild and pleasant. The troubles begin father from the start. The dense vegetation does have its advantages. On two occasions on this hike I spied white-tailed deer as they darted away from me. One of the deer huffed a warning as they sped off. A small pond lies on the trail at the waypoint of the same name. The water tends to be a bit brackish here, but a father and son were fishing on one of the two small piers that stand on the edge of the water. Several small waterfalls dot the path of the creek through the park. Beyond the pond, the trail continues for a short distance before gradually fading from view. The trail does not end so much as it tends to become narrower and less pronounced. By the time I had progressed to the waypoint "Turnaround" the trail resembled an animal trail more than a hiking trail. This seemed a bit odd since the terrain here could easily support a trail and the park continues for some distance to the south. Most of the trail is flat and follows the creek. Side trails that ascend from the creeks get a little rocky. Upon tiring of pushing through the Juniper branches, I doubled back and retraced my steps back to the trailhead. Before scrambling up the rocky slope near the trailhead I ventured to the right of the T section and found the trail was short and well covered with litter. I don't recommend bothering with this portion of the trail except for doing a little community service by picking up a bag of trash on your visit. We need more people pitching in like this to help clean up this park. There is a large dumpster at the back of the school, opposite the side with the pool. Please make use of it and help clean up the area. White tail deer were not the only wildlife noted. 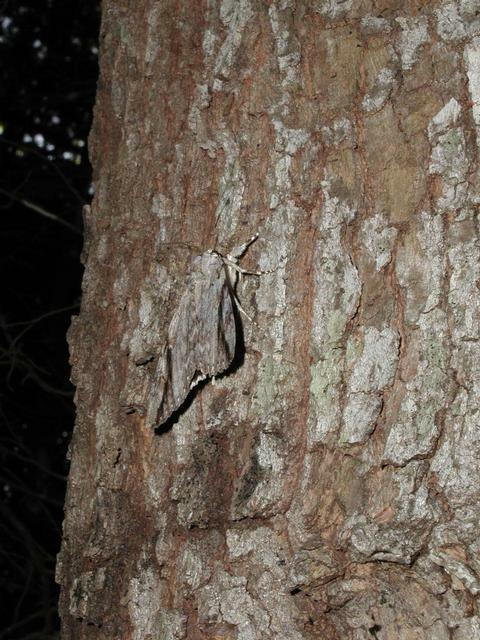 This moth was one of many on a single tree. The state of this park is puzzling. It's surrounded by a nice neighborhood. It has several nice features that should make it a showpiece for the area. But it seems to have been largely forgotten except by kids and those who see fit to dispose of their litter instead of packing it out themselves. Although I only saw two other people on the hike I've given it a less than stellar solitude rating. In part this is because many of the houses lie a short distance from the trail. But the frequent signs of the surrounding developments, mainly in the form of trash, serves as a constant reminder that you have not gotten very far away from anything. Following the less developed trails leads one to some nice spots like this feeder stream. It is possible to find some quaint spots on this trail and I did that near one of the waterfalls. Just downstream a large Sycamore tree had toppled over. As the roots were yanked from the ground they grabbed a large amount of rock and soil with it. I thought the tree was recently felled, since I could see green leaves on its branches in the distance. Upon closer examination I noticed something odd about its trunk, or should I say trunks, since this tree's trunk forked near the base. From the trunks vertical chutes sprouted and rose towards the Sun, each bearing large, green Sycamore leaves. 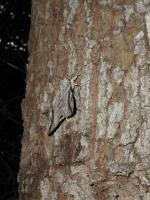 The tree was still alive! I thought that the tree was a good metaphor for this park. Lots of promise, seemingly on its knees and left for dead. But the potential remains, if one does not give up. Let's not give up on this park. Aside from the not fully improved steps down from the trailhead just behind the school (more of a scramble, really) the path is easy to follow. Not overgrown at all, just a few places a tall fella liike me had to duck. 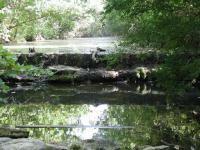 The creek is pretty, and the two ponds (or is it one long pond, hard to tell from the trail) are worthy waypoints. The kids (ages 3.5 and 6) enjoyed sitting on the old pier and looking at the fish and turtles. We stopped at the final dam, but it seems like it would be easy to cross just downstream and hook up with the Mountain View hike. Not nearly as well marked or maintained as Spicewood Valley Trail on the other side of the creek. Saw three different homeless shelters that had been built in the woods near the trail. Around the pond there were a couple of pier type structures built, one of which was labeled with the name of the Eagle Scout who organized building it apparently. Those have fallen into disrepair as well. I hiked from the middle school down to the dam and then connected up with the Spicewood Valley Trail for the rest of my trip. Didn't feel like much of a hike - more of a park; little solitude, not challenging but enjoyable. Did we all go to the same park? Okay: I expected nothing. Found no vines in the way, no trash on the trail, and when you get to the turnaround dont stop.....cross the low-water crossing, to the left and right a very long, fun trail. Way off to the right you climb along the canyon wall and up to a small dam. Solitude: only saw 2 guys walking a dog in 80 minutes (passed them twice). Reminds me of Balcones Park hike but more remote and no scary tunnels and the nearby houses are much further away. Definitely a 3 maybe even a 3.5 We'll be doing this one again. The hike has less appeal than many in Austin. First, you start at a school. 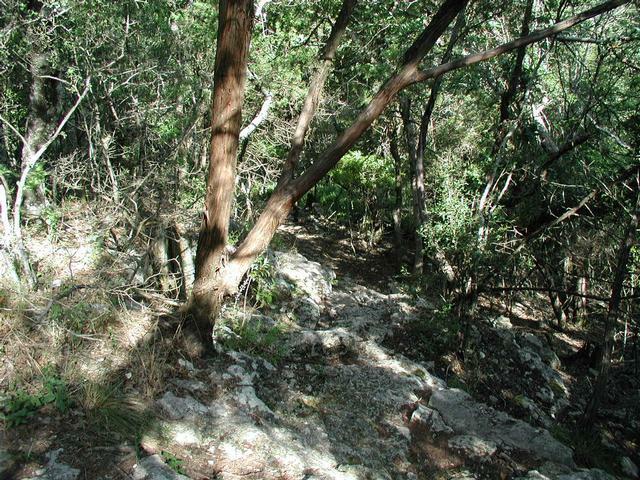 Second, the trail is messy with hanging vines etc that support no views near the beginning. Later you reach a fairly typical straight trail without vistas (after a rocky creek crossing). There are some pretty trees along this trail however, which I would count as the highlight of the whole hike. On the way back we crossed the creek at a different location and got somewhat lost. We had to backtrack and recross the creek to get back on the main trail. So there was a little adventure and room for exploring. One other plus, we saw no one else on the trail that day. 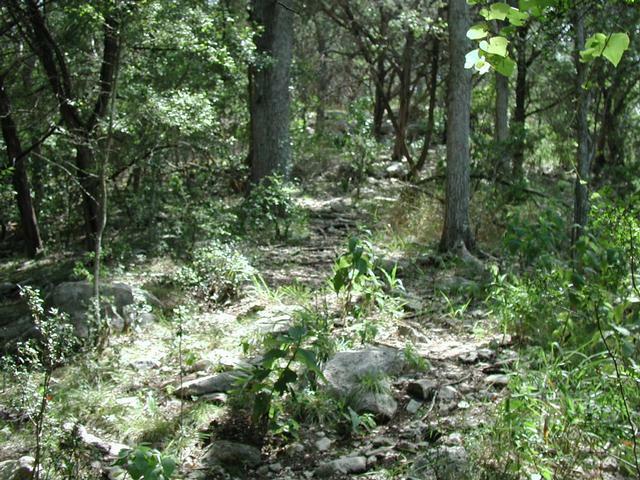 This trail lies in one of the first ravines that mark the transition from the flat Jollyville plateau into the Central Texas Hill Country. The net change in elevation from the schoolyard down to the creek is about 80 feet. Although the passage from the trailhead into the valley is moderately steep, it only takes a few minutes. There are multiple ways through the woods near the pond. The different pathways seem to be bypass routes around ivy and brush. In addition, there is an alternate path heading south from the pond straight up the valley wall. This shortcut to the schoolyard is worth the excursion just to see the 6 ft high boulder that is leaning against a tree. You also get a nice view of the pond if you turn around and descend back into the ravine. I understand how this hike might create mixed reactions. The thick ivy vines, downed trees, and deadwood on the trail provide a sense of adventure, but you will have to crouch low and step carefully at a few points. The pond is a great feature, but has a thick cover of green algae. There is an interesting seating area with multiple benches just below the school, but you may not want to sit for too long when the mosquitoes are out. Ultimately, it's a fun little hike that provides a nice extension to the Spicewood Valley trail. I was a bit worried about the trail based on the description but it's much better now. I was with my son so we just slowly hiked along looking at all the trees and vines. The trail is easy to follow now allow flooding seems to be noticeable in parts. It's really a nice little hike. It basically ends at the waterbridge in the photo above. When you cross the water bridge you connect with the Spicewood Valley Trail http://tinyurl.com/2q7k29 I'll be going back to check into side trails. We did find the outlet from the pond that goes to the creek. It's a narrow chute with exposed roots and rocks. Very cool. This could be a nice trail, especially if it linked with Talleyran/Northwest Balcones Park on one end, and St. Edwards on the other. Unfortunately, it is neglected, and it needs some attention. I went as far as I could on the cleared part of the trail. 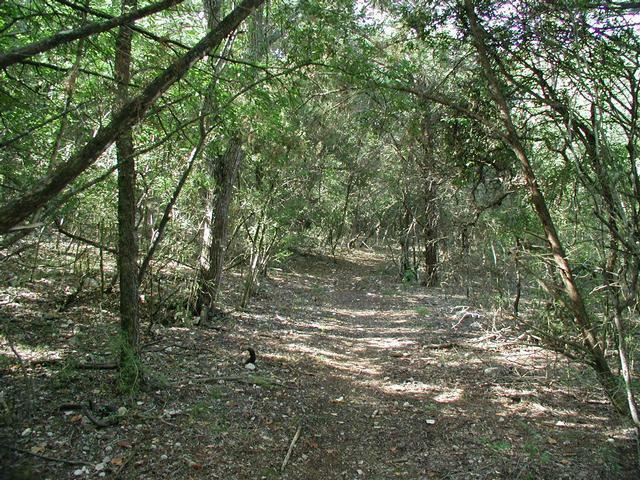 The City of Austin web page does not even state that there is a trail here, but there is. Several areas along the trail need to have some trash picked up and there are sections of trail that are quite overgrown. Still, this trail has a lot of promise if someone or some group would give it a hand.